WhatIfSports.com simulated the World Series 101 times to predict which team will end its title drought. Our simulation has the Cubs defeating the Indians in dominant fashion, winning the series 75.2 percent of the time. The Cubs are projected to sweep the series 13.9 percent of the time, while the Indians only swept the series twice throughout the simulations. The most commonly occurring result was the Cubs winning in 5 games, which happened 21.8 percent of the time. 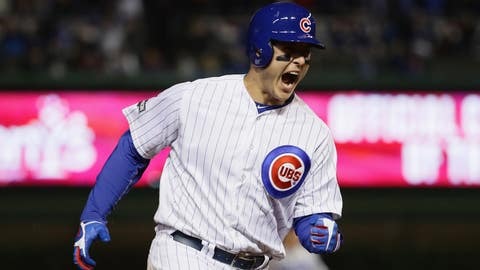 Leading the way for the Cubs at the plate was the dynamic duo of Anthony Rizzo (.284, 1.2 HR per series) and Kris Bryant (.271, 1.47 HR). As a team, the Cubs batted .256 and received plenty of power throughout the lineup that Cleveland was simply unable to generate. The Indians hit just .227 as a team in our projections, despite solid efforts from Francisco Lindor (.262) and Jose Ramirez (.275). The bats for Cleveland weren’t totally to blame, though. The starting pitching for Cleveland is projected to implode in the World Series, with the rotation carrying a 5.01 ERA. Trevor Bauer (5.29 ERA) and Josh Tomlin (6.16 ERA) in particular were no match for the trio of Jon Lester (3.40 ERA), Jake Arrieta (3.56 ERA) and Kyle Hendricks (4.09 ERA). In the end, the depth for Chicago, from the bullpen down to the bottom of the lineup, ended up swinging the series. We’ll re-simulate the World Series after each game to update our prediction, but heading into Game 1, our simulation has the Cubs finally breaking the curse and winning it all.